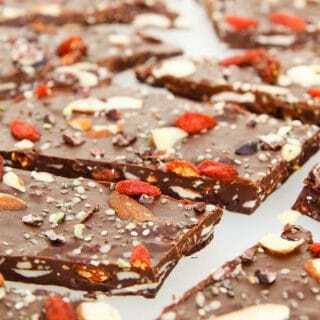 This Chewy, Seedy Healthy Chocolate Bark is crazy good and has quickly become one of my favorite combinations! Completely melt the dark chocolate and coconut oil together using the double broiler method (if unsure, see notes below on how to setup). The melted chocolate should be pour-able. Remove from heat and set aside. Fold the rest of the ingredients (sliced almonds, dried gogi berries, chia seeds, hemp seeds, and cacao nibs) into the melted chocolate. Poor the chocolate-nut-seed mixture onto the prepared baking sheet. Gently spread and tap the tray on the counter-top to even out the thickness of the mixture. Feel free to tilt the tray back and forth to spread out the chocolate to desired thickness. But be sure to keep it thick enough so it remains a bark when cut into pieces. Evenly sprinkle on some additional sliced almonds, dried gogi berries, chia seeds, hemp seeds, and cocoa nibs. Gently press them down if needed. Refrigerate for about an hour or two until the chocolate is completely firm. Break the bark into squares and enjoy! Store leftovers in an air-tight container in the fridge. Chocolate - For vegan, I prefer to use either a chopped up dark chocolate vegan bar or Enjoy Life Dark Chocolate Chips. Chocolate bark is very forgiving, so an additional ounce or two of chocolate (or less) will still work. Just be sure the thickness of the bark after spreading out the chocolate is thick enough to handle the toppings (i.e. not too brittle). Find one medium size pot and a metal bowl. The size of these two items should be such that when the metal bowl is placed on top of the pot, the two are nested together. Add about 2 inches of water to a saucepan and simmer on low-medium heat. - Add the chocolate chips to another metal bowl. Stir frequently until the chocolate chips are completely melted.